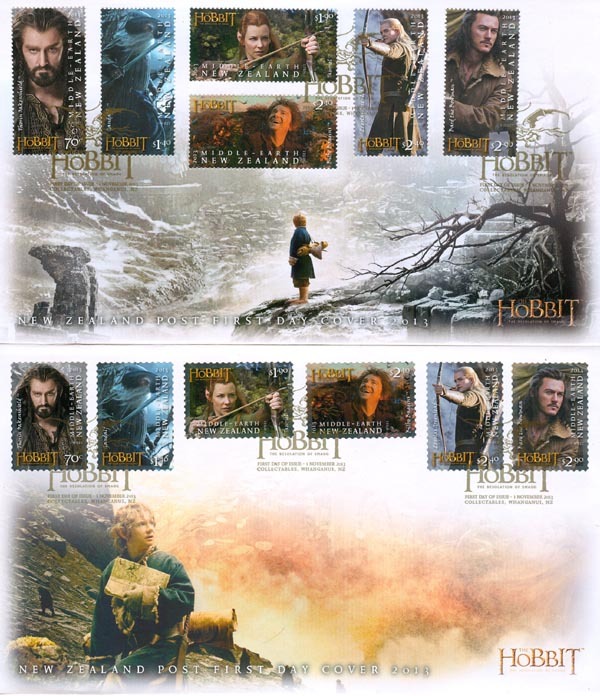 On this date, six stamps were issued, commemorating the New Zealand production of 'The Hobbit: The Desolation of Smaug' scheduled to premier on 12 December 2013. These six stamp designs were offered in gummed and self adhesive forms, as well as booklets, FDCs, miniature sheets, maximum cards and Presentation Pack. Unless stocks are exhausted earlier, these items will remain on sale until 31 October 2014. After that date, another set of stamps will be issued commemorating 'The Hobbit: There and Back Again'. For further information regarding these items, go to the The Hobbit: The Desolation of Smaug NZPost Site. 70c - Thorin OakenShield - As a young Dwarf Prince, Thorin witnessed the destruction and terror wrought when a great fire-breathing dragon attacked the Dwarf Kingdom of Erebor. When no one came to the aid of the surviving Dwarves, a once proud and noble race was forced into exile. Now, as the strong, fearless fighter and respected leader of The Company of Dwarves, Thorin is determined to reclaim his homeland and destroy the beast that brought such misery upon his people. $1.40 - Gandalf - One of the most powerful Wizards in all Middle-earth, Gandalf the Grey joins the quest to reclaim the Dwarf Kingdom of Erebor and the great treasure that lies within its stone halls from a fire-breathing dragon, Smaug the Terrible. Along the way, Gandalf finds evidence that an ancient evil may have found its way back into the world. In order to uncover the truth, Gandalf must leave his companions to fend for themselves - a journey that will take him into the darkest corners of Middle-earth where his worst suspicions are confirmed. $1.90 - Tauriel - A Silvan Elf, this Daughter of Mirkwood is as deadly as she is beautiful. A favourite of King Thranduil and Captain of the Woodland Guard, Tauriel's job is to follow the orders of the King without question. However, Tauriel has a strong will and unyielding passion for what she believes is right. An expert fighter, she carries signature weapons including twin daggers and a bow and arrow. Like Legolas, Tauriel is extremely fast and agile in battle. Although she has lived for many hundreds of years in Middle-earth, she remains one of the youngest of the Elven folk, and has rarely ventured beyond the borders of the great forest. $2.10 - Bilbo Baggins - Like all Hobbits, Bilbo Baggins is fond of his comfortable existence, all he needs to be happy is a full pantry and a good book. When the Wizard Gandalf and 13 Dwarves unexpectedly appear on Bilbo's doorstep and invite him to join them on a dangerous adventure, Bilbo's life changes forever. Initially skeptical of the invitation, Bilbo's spirit of adventure leads him to join the Company of Thorin Oakenshield and become the "burglar" required to complete their quest to outwit a ferocious dragon and reclaim the Dwarves' stolen treasure. To everyone's surprise, including his own, Bilbo's wit and courage prove that there is indeed more to this Hobbit than meets the eye. $2.40 - Legolas Greenleaf - Although a Prince of the Woodland Realm and a High Elf, like his father Thranduil, Legolas is more likely to be found patrolling the forest alongside the Silvan Elves of the Woodland Guard than in the Court of the King. Tall and lithe, he is a lethal fighter and fiercely loyal to his father and his people; however, events in the outside world have begun to encroach upon the insular world of the Wood Elves. A growing sense of foreboding forces Legolas to choose between the will of his father and his own conscience. $2.90 - Bard the Bowman - When Thorin and Company encounter a mysterious man of Lake-town, they take him for a simple bargeman, but the stranger's extraordinary skills as a bowman suggest he is not all that he seems. Bilbo discovers Bard to be a kind and decent man, protecting the poor folk of the town from the greed and tyranny of The Master. Despite the risks to himself, Bard agrees to provide the Dwarves with food and shelter, only to discover their true goal is to reach the Lonely Mountain and reclaim their homeland from the Dragon Smaug. Bard, more than most, has reason to fear what will happen if the Dwarves should wake the sleeping beast.